Widows represents a further step into the mainstream for co-writer and director Steve McQueen. Ironically, given 12 Years a Slave was essentially an art movie, this is likely to be less financially successful than its predecessor. Business Insider attributes this to the November release date; whatever the reason it’s not for the lack of thrills within the film. Based on Lynda LaPlante’s ’80s TV series the film centres around a heist undertaken, in desperation, by the widows of thieves. It has elements of a number of genres, including the heist movie, political corruption thriller and urban gangster. McQueen overlays a political analysis that is both specific to Chicago (the film’s setting) and, he argues in his Sight & Soundinterview (November), the world. McQueen manages to both revitalise the car chase (the brilliant opening) and use sound in distinctive ways. An example of the latter is where Daniel Kaluuya’s psychopath is listening to Black Panther Alfred Woodfox, on the radio, talking about his 44 years in prison. This brings in the discourse of racial politics and, particularly in one scene, #BlackLivesMatter (not as convincing as a similar scene in The Hate U Give). Sound is also to the fore when Colin Farrell’s conflicted politician, Jack Mulligan, leaves the Projects to return to his leafy home, barely a minute away. Whilst Mulligan rages on the soundtrack the camera remains on the car’s bonnet observing the shift in wealth of the environment. It’s a stellar cast: Viola Davis, Michelle Rodriquez, Liam Neeson, as well as the aforementioned Kaluuya and Farrell. Robert Duval plays Mulligan’s dad and leaves a lasting impression as a hate-filled demagogue. The budget, notwithstanding the immense financial success of 12 Years a Slave, was a meagre $42m so it’s obvious that the talent is keen to work with McQueen. 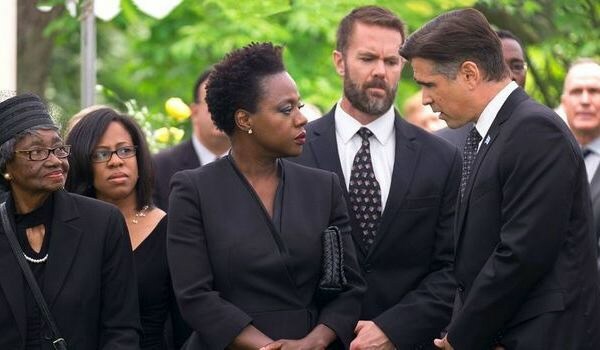 Given the director’s ethnicity I was surprised to see, once or twice, that Viola Davis’ face was less clear than the white actor in the scene. It’s difficult to shoot both clearly, though I imagine digital technology could ‘cure’ this, and it is commonplace to have the black face more undifferentiated than the white. I’d’ve thought McQueen, and his cinematographer Sean Bobbit, would have reversed the power relationship. However the film is as much about gender as race and McQueen ensures we have no doubt about the evil of toxic masculinity. There’s one moment when Neeson screws up his face and wails about saving himself that is especially noteworthy. Davis portrays her widow as indomitable in the face of her circumstances and Elizabeth Debecki’s transformation of an abused wife to a self-contained woman is entirely convincing. Unsurprisingly, Widows doesn’t have the power of 12 Years a Slave, the subject matter sees to that, but McQueen confirms himself to be one of the most imaginative directors on the circuit. What has happened to McQueen ? This is a solid actioner that hasn’t stayed around too long despite not being short on thrills and twists and interesting characters. It seems to have failed to connect. Maybe people were expecting more than an efficient heist thriller. I know I was. The wrap-up at the end seemed to leave a lot of plot threads dangling in favour of a happy(ish) ending. It all seemed rather uncomplicated for Mr McQueen. Life is more complicated than that, armed robbery even more so.